The 4K E.T. : The Extra-Terrestrial Blu-ray really stands out in 2160p resolution with an aspect ratio of 1.85:1 and H2.65 HVEC Codec. While the film was never intended to be seen in this advanced format the picture doesn’t come across as grainy and the effects don’t seem fake. I was eleven years old when E.T. The Extra-terrestrial movie came to theaters. I can remember with fondness being enchanted by the little, brown, wrinkled alien with the big eyes and glowing fingertip who only wanted to find a way back home and the young boy determined to help him. I also remember running out to buy the best, new candy…Reese's Pieces. That was 35 years ago - no cracks about my age – and the truth is the film is just as beloved today as it was then. It has become a classic that will live on for generations to come and Universal has just brought it back to the forefront with its 4K Blu-ray release. When E.T. 's spaceship leaves without him he must find a place to hide. Scared and alone, he finds an open shed in a residential neighborhood to stay in but is disturbed by a young boy named Elliot (Henry Thomas; Legends of the Fall). Elliot and his siblings, Michael (Robert MacNaughton; Frankenstein vs. The Mummy) and Gertie (an adorable Drew Barrymore; Fifty First Dates) are hurting themselves as their parents' divorce has taken a toll on them. The three plot to help E.T. and hide him inside the house without their mom, Mary (Dee Williams; Cujo) finding out. Meanwhile, government officials are looking for E.T. and become increasingly suspicious of Elliot. As they hone in on him and his home they eventually find the alien creature and begin experimenting on the poor little guy. Elliot, Michael and Gertie fear E.T. is dead but find out that isn't true and devise a plan to get him "home". They grab E.T. and bring him back to the woods with the adults hot on their heels. In a touching but tearful ending, Elliot and E.T. say goodbye as E.T. 's ship has returned for him and he leaves but not before making an impact on the three siblings that will endure for the rest of their lives. The young cast does a remarkable job for their young ages and Barrymore is a stand out stealing every scene she is in (leading her to a successful and long Hollywood career). Of course, their performances are a testament to the superb direction by the brilliant Steven Spielberg (Saving Private Ryan). With him at the helm, the film was destined to be great but I think it surpassed his expectations. The animatronic alien was cutting edge for its time and the team that created it infused a warmth and sweetness into it simply through his big eyes. The 4K Blu-ray really stands out in 2160p resolution with an aspect ratio of 1.85:1 and H2.65 HVEC Codec. While the film was never intended to be seen in this advanced format the picture doesn't come across as grainy and the effects don't seem fake. The DTS-HD Master Audio 7.1 is sharp and clear and enhances the video nicely even though the original film was recorded with a 2.0 soundtrack. The memorable orchestration composed by the masterful John Williams is legendary and the updated format does it justice beautifully. 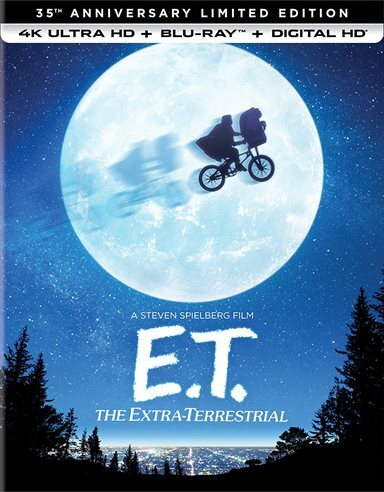 The extras are on the traditional Blu-ray and include deleted scenes, Steven Spielberg & E.T., The E.T. Journals, A Look Back, The Evolution and Creation of E.T., The E.T. Reunion, The Music of E.T. : A Discussion with John Williams, 20th Anniversary Premiere, Designs, Photographs and Marketing, Theatrical Trailer and Special Olympics TV Spot. None of these extras are new as they were included on the 2012 Blu-ray release but if you haven't seen them before they are a treat and are full of great details. E.T. The Extra-Terrestrial took everyone by surprise when it was first released but has endured the test of time and is a "new" classic that deserved to be rewatched and introduced to a whole new generation of youngsters. Everyone should own it and the latest 4K version is the best quality out there. Buy the combo pack, you won't be disappointed. Download E.T. : The Extra-Terrestrial from the iTunes Store in Digial HD. For more information about E.T. : The Extra-Terrestrial visit the FlickDirect Movie Database. Mrs. Hazlett-Rose attended Hofstra University where she earned her bachelor's degree in communications and is Vice Chair of the Florida Film Critics Circle and a member of the Society of Professional Journalists. She can be found in print, online, and on talk radio, WENG 107.5 FM. Read more reviews and content by Allison Hazlett-Rose.